Fallon, Sally; Enig, Mary G.
Newtrends Publishing, Inc.. PAPERBACK. 0967089735 Brand new book.Buy with confidence. Money Back Guarantee.Expedite Shipping Available. International shipment available. . New. 1995-01-07. New. Ships with Tracking Number! INTERNATIONAL WORLDWIDE Shipping available. Buy with confidence, excellent customer service! NEWTRENDS. New. 10.04 x 7.54 cm. NewTrends Publishing. Paperback. 0967089735 Please allow 4 - 14 business days for Standard shipping, within the US. Thank you for supporting our small, family-owned business! . Fine. 2001-01-01. 2nd Revised. NewTrends Publishing. Paperback. 0967089735 Please allow 4 - 14 business days for Standard shipping, within the US. Thank you for supporting our small, family-owned business! . New. 2001-01-01. 2nd Revised. Washington, D. C.: New Trends Publishing, Inc., 2001. 674pp.. Second Edition, Revised. Paperback. Fine. Illus. by Dearth, Marion. 4to - over 9¾" - 12" tall. NewTrends Publishing. Paperback. 0967089735 Please allow 4 - 14 business days for Standard shipping, within the US. Thank you for supporting our small, family-owned business! . Fair. 2001-01-01. 2nd Revised. NewTrends Publishing. PAPERBACK. 0967089735 Special order direct from the distributor . New. NewTrends Publishing. Paperback. 0967089735 . Fair. 1999. NewTrends Publishing, 1999-10-01. Revised Second Edition. Paperback. New . New; Revised Second Edition; Recalling the culinary customs of our ancestors and looking ahead to a future of robust good health for young and old. Nourishing Traditins offers modern families a fascinating guide to wise food choices and proper preparation techniques. 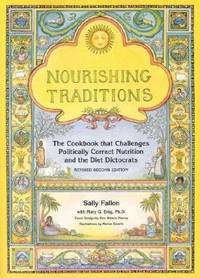 Nutrition researcher Sally Fallon unites the wisdom of the ancients with the latest independent and accurate scientific research. The revised and updated Second Edition contains over 700 delicious recipes that will please both exacting gourmets and busy parents. NewTrends Publishing. Paperback. 0967089735 . Good. 1999. NewTrends Publishing. PAPERBACK. 0967089735 BRAND NEW, GIFT QUALITY! NOT OVERSTOCKS OR MARKED UP REMAINDERS! DIRECT FROM THE PUBLISHER!|2.8 . New. NewTrends Publishing. PAPERBACK. 0967089735 Crisp pages and tight binding. Appears unread. Slight shelf wear on cover and edge. . Fine. Newtrends Publishing, Inc, 1999-10-01. Paperback. Used: Very Good. NewTrends Publishing, Inc., 1999-10-01. Paperback. LikeNew. NewTrends Publishing. PAPERBACK. 0967089735 Item in good condition. Textbooks may not include supplemental items i.e. CDs, access codes etc... . Good. NewTrends Publishing. PAPERBACK. 0967089735 Item in acceptable condition! Textbooks may not include supplemental items i.e. CDs, access codes etc... . Fair. NewTrends Publishing. PAPERBACK. 0967089735 Cover with minor shelf wear. No spine creases. Pages unmarked. Binding straight **Tracking on all US orders. Most orders shipped within 24 hours. International customers will be reimbursed a portion of unused shipping charges.*** . Very Good. New Trends Pub Inc, 1999. Large Softcover. Good. Tall softcover. Sound & good copy, light to moderate shelf/reading wear. May not be available for international shipment due to weight/size. New Trends Pub Inc, 1999. Large Softcover. Good. Medium softcover. Sound & good copy, light to moderate shelf/reading wear, thumbing wear, slight bend to book. May not be available for international shipment due to weight/size. NewTrends Publishing. PAPERBACK. 0967089735 Like new condition. . Fine. 2001. NewTrends Publishing. Paperback. 0967089735 Water damage. Great reading copy. . Fair. 2001-01-01. 2nd Revised.